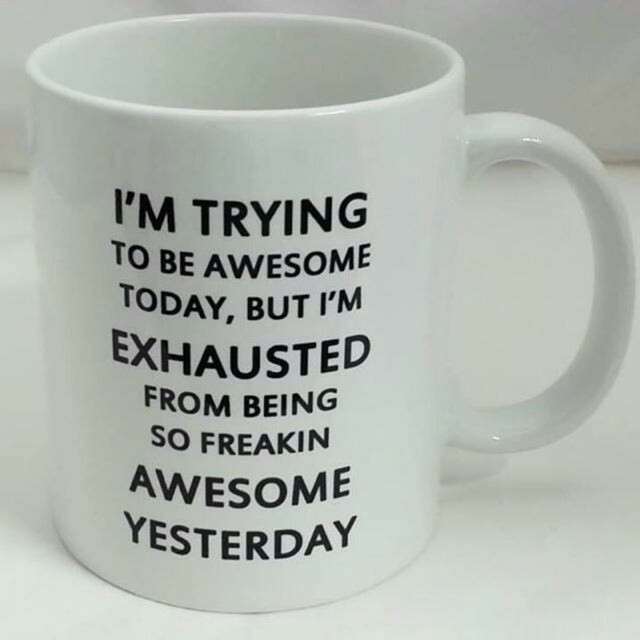 I know I am the least awesome person I know or have ever heard of, but today as I was reading Facebook posts from friends I saw a photo of a coffee cup with the inscription “I’m trying to be awesome today, but I’m exhausted from being so freakin’ awesome yesterday.” and instead of making me laugh, it made me shed tears. Tears for remembering the times I was exhausted and still called on to be “awesome”, called upon to exhibit real world super powers, 18-24 hours a day 7 days a week for a year, and again later in the three months before William died. I tried desperately to be awesome and no matter how awesome I managed to be it was never going to be awesome enough. There was no imaginable level of awesome that would have been enough to save him, yet I still find myself screaming aloud “I’m so sorry!” to him. When someone we well and truly love is desperately sick, we don’t have a choice other than to develop super powers. We have to rise to the level of utterly awesome. It’s a small thing really, to be awesome for your business meeting so please don’t wave your brief case around and bellow about how “awesome” you were and how you’re some sort of business “superman/superwoman”. You might have been cool, knowledgeable, and confident, but that meeting lasted what? Ten minutes? Thirty minutes? Get over it. People who are out there caring for those they love have to maintain superhuman awesome for weeks, months or years. They will never, not ever, puff up and brag over drinks nor will they ever feel like doing so because they know that even though some may think they not only hit but sustained the upper heights of awesome, they know it wasn’t and could never be awesome enough. It’s great to feel good about yourself and proud of your business or artistic accomplishments, just know you’ll at some point in your life need to reach levels of awesome that make your spread sheet presentation feel like a vacation in the Bahamas. There’s a mother out there who has a child with Rett Syndrome who is running a house, a business and taking care of her other two children all while taking constant care of the daughter who has been having back to back seizures all day for days. She doesn’t feel awesome at all. She feels rather helpless most days, but it’s a job and a level of strength she can’t and wouldn’t even think of quitting. People like this aren’t doctors or nurses. These people are the true front line of health care. They don’t get to leave after a rough 12 hour shift. They don’t get days off, vacation time, or a salary. In many instances these people can barely take off ten minutes to take their own shower, much less a lunch hour. If they can find someone to come sit with their loved one for an hour, they can’t use it to nap, they have to go to the grocery, the attorney, the bank, or the post office. Doctors and nurses can be awesome, but they can also punch a clock and be gone. People caring for seriously ill husbands, wives or children are dragging themselves into bed for what probably amount to no more than cat naps. They may never have lifted more than 50-100 lbs and suddenly they’re lifting up to 300 or more every hour. They may not remember where they left their keys, but they’re keeping track of 5 to 15 serious medications with varying dose times so that it is impossible to sleep more than a couple of hours at a time. They’re running around juggling thermometers, medications, washcloths, heating pads, fresh sheets, food, drinks, mops, Lysol spray and Clorox wipes, bank statements, multiple medical appointments, bills, insurance forms, financial forms, and legal forms as well as trying to be good, uplifting company for the person they care most about. They’re out there trying to figure out ways to get over, under or through obstacles the disease, the treatments, the multiple medical offices, the financial institutions, insurance companies and the bureaucracy erect solidly in their paths. Just as soon as they leap, climb, dig under or plow through those hurdles, the disease, illness or red tape changes the game and they have to start all over. They are Sisyphus. If you’re a decent human being caring for someone you love who is desperately ill, no matter how tired you are you’ll will yourself be awesome today, you’ll exert that same will tomorrow, and you’ll claw your way to a whole new level of awesome later if it’s needed. You’ll be awesome when there’s hope and you’ll be awesome if there’s no hope left. It just won’t ever feel like it no matter what anyone says or how many coffee cups you own to remind you.